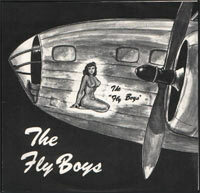 Not the Flyboys from California. This is the Minnesota powerpop band with the same name. Jetsetter is a classic powerpop song that deserves to be comped. The b-side has the country flavoured Cruel World and a cover of one of the worst rock n roll songs ever Hippy, Hippy, Shake. The only thing I’ve found is their inclusion in Felix Havocs Minnesota Punk Rock Discography.